Johnson recorded 16 tracks in the Alamo City in the 1930s, some of which cemented his rise as a musician before he died under mysterious circumstances in 1938. 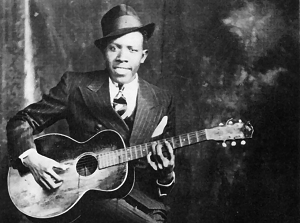 Robert Johnson in Memphis, around 1935. In November 1936, he recorded 16 tracks and from those recordings, “Terraplane Blues” sold well enough that he became an even bigger name among blues players. His label decides to bring him to Dallas to record more music. Though it’s disputed at which hotel in San Antonio he recorded, the Gunter Hotel had a full recording studio built for live audiences to listen to musicians while they’re recording, Moser says. Some people around San Antonio hotels say that his recordings could have taken place at a different hotel, like the Bluebonnet Hotel or the Texas Hotel. Details of Johnson’s life have always been swirled in mystery – did he sell his soul to the devil? What happened at the crossroads in Mississippi? – but Moser says among the biggest questions about his life is how he died. His three grave sites, spread across Mississippi only fuel the intrigue.